Shopping for Dads can be difficult. The best gifts are those that they normally would not think of buying themselves. The idea is to give them something they will remember and that isn’t too expensive. Finding the perfect gift is a challenge. Below are two ideas that are perfect gifts for under $50. They are unique and something he will appreciate and enjoy. It’s a throw blanket with a foot pocket. It also folds into a pillow. It’s a great gift because its large enough for two adults and super comfortable. It makes watching a movie or sporting event more fun. Everyone in the house will enjoy the TV Blanket, so it makes Dad’s present something that he can share with the family. 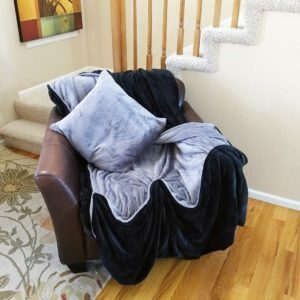 Since it folds into a pillow it can be used when you have a lot of people over and need something to lay on or support your back while sitting on the floor. All in all, it’s a unique gift that any Dad will love. It can be used over and over again. Each time he uses it, he will think of you and what an awesome gift giver you are! Its also a great blanket to bring to any sporting event. Sitting on a hard stadium bench can be uncomfortable after several hours. The TV Blanket folds into a pillow so it makes it easy to take to the game. Use it to sit on and create a soft seat. If it gets cold then unfold the blanket and use it to keep warm. Also, since it is large, you can easily share it with others. Everyone will love it. Its the perfect stadium blanket! It also comes in several colors, so you can match your favorite team colors and show extra team spirit. 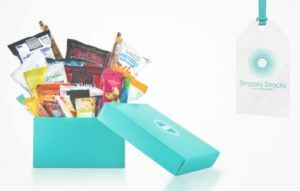 This gift box includes 25 awesome snacks such as jerky, popcorn, bars, chips, fruit, and nuts. They are healthy snacks that taste great. It has a little bit of everything and will be an instant hit. He can take it to work and have snacks that will last for weeks, or he can go through it a little faster and share it with his co-workers. Either way it’s something he will enjoy as everyone loves a good snack. Also, every Dad is happier with a full stomach! It also includes a personal note, so you can write something special to show him how much you appreciate everything he does.